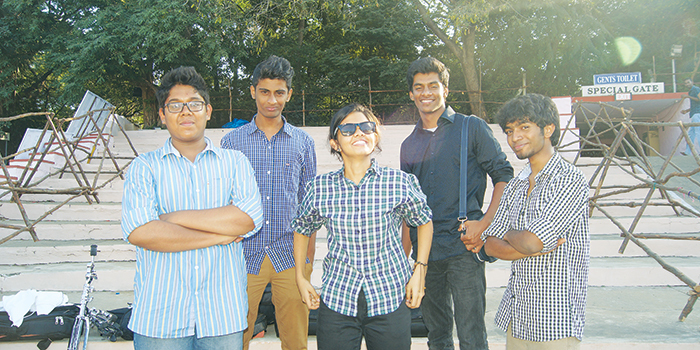 They are just a three-month-old band, but Chrome O Soul caught everyonea��s attention at IIT Saarang, where they won best bassist, drummer, keyboardist, vocalist and also got a spot in two music events. Featuring five college goers, the band started off as an experimental jazz fusion funk band, influenced by gospel and Neo Soul, but is now venturing into electronic music and metal, too. a�?Our name fits since our music is from the soul and wea��re experimenting with a colourful spectrum of genres,a�? says lead singer Sharanya Gopi Nair, who is studying at the National Institute of Fashion Technology and also sings with groups like theA� Madras Musical Association and Mellow Circle. The other band members include lead guitarist Godfray Immanuel, who is doing his B Com from Madras Christian College, bass guitarist Reshwin Nishith, a first year VisCom student, Rahul Muralidhar on the drums who comes from a family of musicians and Jerard Felix who composes music. The five of them jammed for the first time on September 29, at Kilpauk Medical College culturals. The banda��s first song was Beef Biriyani, followed by Dona��t Walk Away, The Fun Song and they are currently working on their fourth song.